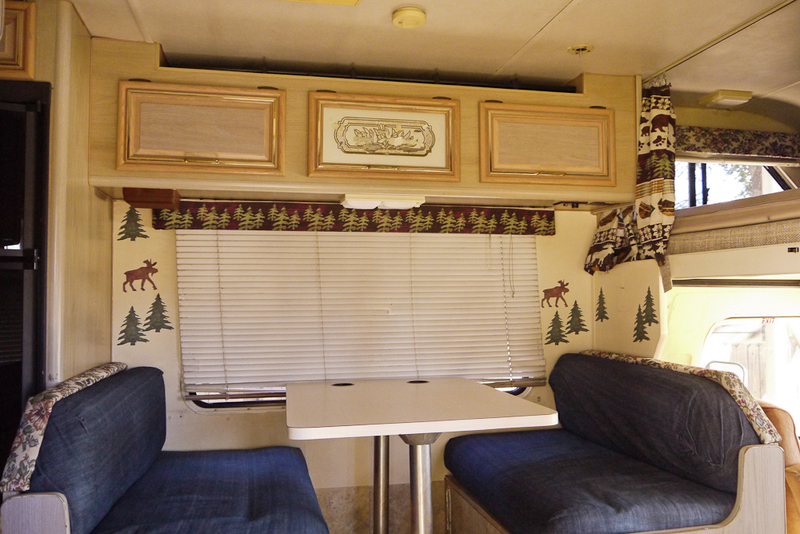 When we first decided to take this expedition, I jumped at the chance to go RV hunting. I searched CraigsList twice a day from San Diego to Fresno for over two months looking for a fairly-clean, mechanically-sound, used RV. Then I spent several weeks driving a few old, smelly clunkers (the online photos were often as current as Match.com profile pics). When I finally found what I thought to be “the one”, a series of unreturned phone calls and delays and other “interested parties” worked to keep us apart but, eventually, patience and persistence prevailed and we are now the proud owners of a 24-foot 1999 Ford Jamboree! Our new highway vessel has a few grandma-ish elements that, cute as they are, we have elected to update – so take one last look at the denim, moose and pine trees. She’ll be back soon after a mild makeover. And with a new name – any suggestions? 9 Responses to Knight Rider and KITT. Capt. Kirk and the USS Enterprise. And us? – name that RV. Well we have had our RV for over three years now and have not been able to name it either. If you end up with a good surplus name, feel free to toss it my way! 1. “Eagle 5” which was the name of the recreational vehicle spaceship in the movie. Or, since the year it was built was 1999, you could call it the “Millenium Falcon”. Or the “Nearly-Millenium Falcon”. Well, these are far and away some of the best suggestions yet! 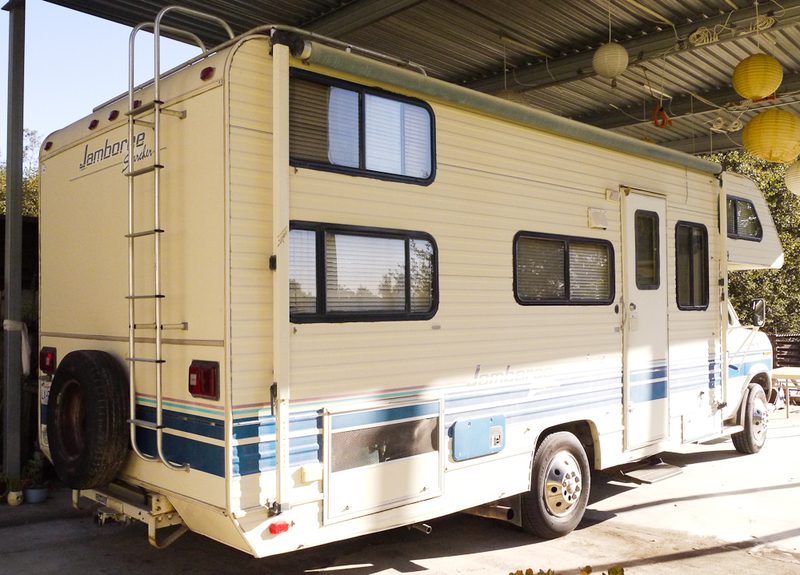 Since it is a 1999, we considered calling it “the RV formerly known as”, but I’m really liking The Schwartz. Thanks, Mendy. what abt keeping with foot theme: bigfoot/sasquatch… or a totally different direction The Cramalot Inn. Nice. We’re going to post a survey of names on Facebook next week – vote for your fav! 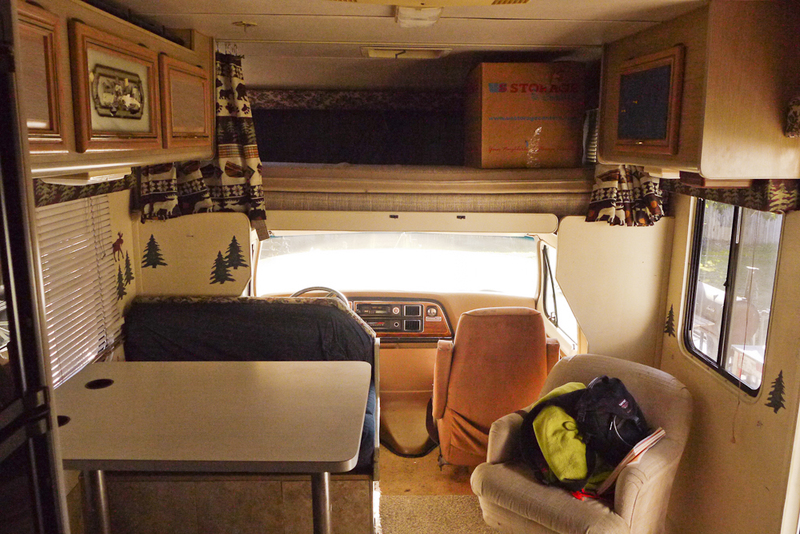 Until now I have only seen the ‘after’ pictures as your Craigs List post selling the vessel is what drew me to your blog…fantastic face lift…I must say..this is truly the RV that was meant for me…I’m so bummed I didn’t move quickly….but glad I have found the two of you for some inspiration and admiration. Thanks Sherry! We had a great time doing the remodel. And we are so very sorry to see the Schwartz go, but this is Life, right? Looking forward to staying in touch!